Lessons that are all about you! 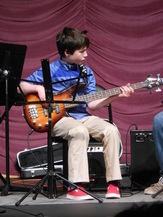 If you are looking for Guitar, Bass or Ukulele Lessons you are at the right place. We have lessons for children, teenagers and adults. We teach all levels. Beginners are welcome! 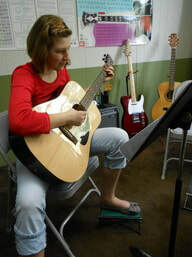 Guitar instruction is offered as a weekly 30, 45, or 60 minute private lesson on electric or acoustic guitar. Whatever your goals are, our teachers are here to help you and customize a lesson plan for you. Beginner guitar and bass students of all ages will learn how to read standard and tab notation, play melodies, chords, and improvise. All students are highly encouraged to bring recordings of their favorite songs, band, or players to learn their favorite songs. Method books will likely be supplemented to ensure a well-rounded musical development. Lessons for intermediate to advanced Guitar and Bass students will focus on expanding technique, repertoire, theory, and learning to transcribe. Intermediate students are typically graduated out of using method books and starting to learn more complex pieces of music. The ukulele is a great instrument for kids and adults to learn. They are affordably priced and easier to play than a guitar, so ukulele lessons are a great way to get started before taking guitar lessons. Learn more about our Ukulele program HERE! Our Guitar, Bass and Ukulele teachers can help give you the skills, knowledge, and confidence to take out your guitar and play your favorite songs for family and friends. New To Guitar, Ukulele or Bass Lessons? 1. Teaching Methods: Learn faster and better from a qualified teacher. The guitar, bass, piano and drums are fun instruments, and for the most part it's not hard to learn a few easy things to play on them. Unfortunately it is also easy to develop a lot of bad habits that make it harder to advance. Without guidance it is also easy to get "stuck in a rut". Many guitar & bass students start out trying to play by ear, have a friend show them a few chords, learn off the Internet, or try to learn on their own from a book. While this can work for a few people, most stop playing after a while because they lose interest and motivation from doing the same thing over and over. A professional teacher and musician can help you plan the fastest route to your playing goals and teach you the proper technique along the way. They can guide you in the best choice for a guitar book and customize your lessons according to your interests and learning style. With a qualified instructor at Moscow Music Academy, you'll be strumming real chords and making music from day one as you learn to really read music and play from the 3 standard notation systems. 2. The Right Instrument: There are so many different guitars, basses and ukuleles available it can be overwhelming knowing where to begin. The age of the musician and style of music you want to play can help you decide which type to have. Here is a brief overview of the most common types of guitars and the style of music they create. If you do NOT have a guitar or need help finding the right size for your child we can help you find affordable guitar packages (guitar and case) to get you started the right way. Classical Acoustic Guitar: Also called the Spanish guitar, it has nylon strings and is mainly used for classical, pop, folk, Latin and jazz. This is a great type of guitar for young beginners because the nylon strings have lighter tension and are easier on the fingers. Classical guitars are small bodied and more uniform in shape which many find more comfortable to hold. It has a wider neck and flat fingerboard. This design lets you play finger-style where the strings are plucked to play the melody. You can also play chords and bass lines to accompany the melody. Acoustic Steel-String Guitar: A descendant of the classical guitar, these are strung with steel strings which produce a brighter sound. Three of the most common body styles are the small body "classic" (or concert shape which is most similar to a classical guitar), the dreadnaught (also referred to as the country-western style) and jumbo guitar, which are mainly used for pop, country, ragtime, blues, and rock. This type of guitar is best suited for older beginners and adults because the tension of steel strings requires stronger fingers to play and because the body shape is a bit larger than a classical guitar. Beginners may want to start with light or light-medium gauge strings, then work their way up to medium or heavy gauge strings as their fingers grow stronger and tougher. "Cutaway" acoustic guitars have a part of the body cut away to let you reach frets in the higher positions on the neck for more advanced playing. Best Value Recommendation under $200: Check out the Yamaha student models Yamaha FS800 (small body), and Yamaha FG800 (dreadnaught). If we don't have the one you want in stock we'll happily order it in for you. Acoustic/Electric Guitar or Bass: This type of instrument looks just like a regular acoustic guitar but has pick-ups built into the instrument. It can either be played acoustically or plugged into an amplifier. Electric Guitar or Bass: These come in a few different body styles; solid or hollow and have pick-ups. Because electric guitars and basses don't have (or have a limited) sound box, they are too soft to be heard except for individual practice in a fairly quiet environment. They are designed to be plugged into and played through an amplifier. A 10 to 30 watt amp should work for home practice. The sound can be enhanced and altered with a variety of effects pedals. Comes in single and double cut-away styles. Best Value Recommendation under $200: Check out the Fender Squire (Stratocater or Telecaster) student models, or the Yamaha Pacifica Series. Your local instrument store may have a guitar/case package so be sure to see them too. For kids ages 6 to 10 we recommend they have the 3/4 size version of the Fender or Yamaha electric guitars. 3. The Right Tools: Things that are good to have -- a case for your bass, ukulele or guitar, metronome, tuner, picks, replacement string(s), neck strap, and a music stand, to name a few. Visit our online Books & Gear store to see our Teacher Recommended Products. • A Guitar Case ~ Cases keep your instrument protected going to and from lessons and when stored at your home. They are available in soft shell (also called a “gig bag”) and hard case styles. Our guitar packages include them or you can buy one elsewhere for $50-100. • Metronomes ~ These help you develop your timing so that you learn to play at a steady pulse. They can be adjusted to many different speeds, from slow to very fast. Next to having a case for your guitar, this is THE next most important accessory for a beginner to have. CLICK HERE to get the BEST free metronome apps courtesy of Moscow Music Academy! • Tuners ~ These help you keep you guitar or bass in tune. The device “listens” to the vibrating sound of your string when plucked and then tells you which way you need to turn the peg (up or down) until the string is in tune. Tuners range in price from $12-35 for your basic models or CLICK HERE to get the best FREE tuner app courtesy of Moscow Music Academy! • Music Stands ~ They help keep your music or book in an upright position so you can easily read it and keep your body in a balanced playing position. You can make a simple one out of a file folder, use a recipe book holder on a table, or purchase one for $15-50. • Picks ~ You'll need them if you plan on strumming chords or playing solos. You can get your custom Moscow Music Academy pick here or one from any local music store. They range from 25 cents to $1 per pick. We suggest ones that are about the size of a quarter and are comfortable to hold. • Strings ~ It's a good idea to have an extra set (a packet that contains all 6 strings) in case you need to replace one that breaks. Sets run from $7 up. Individual strings run $2-10 each. • Neck Straps ~ These attach to the button on the bottom, and top of the neck of the guitar or bass. Some instrument packages include them or they can be purchased for $5-25. If you plan to play standing upright you will definitely need to have one. Need help choosing the right guitar, ukulele or bass gear? We are happy to assist you in your purchase. This service is FREE to all students who register for lessons at our studio. We take your needs and musical preferences into consideration to help you find the right style guitar or bass that fits YOU best. Already have a guitar or bass but not sure if it's suited for you or your child's lessons? We are happy to look it over and make recommendations. We appreciate your consideration and interest in making music and look forward to mentoring you in your musical journey soon! or computer are filtered out as SPAM and not delivered.